This double-cutaway beauty has a mahagony body, with a solid, beautifully carved, quilted maple top and a contoured Leopard Wood back. The transparent cherry red finish, black pearloid pick guard and gold hardware, including gold pickup covers and gold control knobs with abalone caps, give the Python extra-ordinary visual appeal. 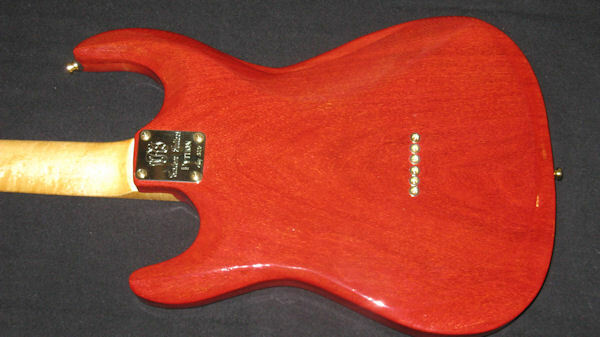 The satin-finished, flame maple neck, which is built for speed, has a separate figured maple fingerboard. If you are in the market for a high performance Custom guitar of breath-taking beauty, this one is for you! Mahagony body, with beautifully carved, quilted maple top and contoured Leopard wood back. Satin-finished flamed maple neck, with maple fingerboard and abalone dot inlays. 3 Seymour Duncan single-coil pickups, (Antiquity at the neck, Vintage Staggered in the middle and Antiquity, Texas Hot in the bridge position) that deliver clean, warm and fat vintage tones, ideal for rock and blues. 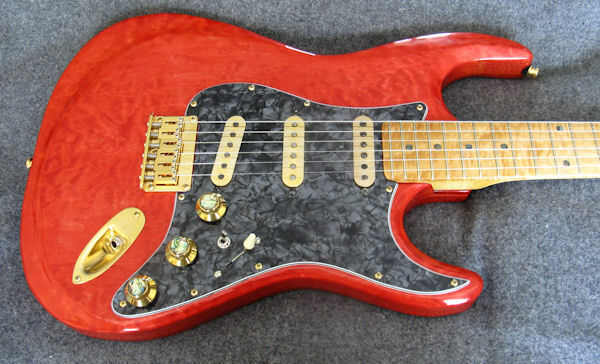 Master volume control, two tone controls and 5-way pickup selector switch. 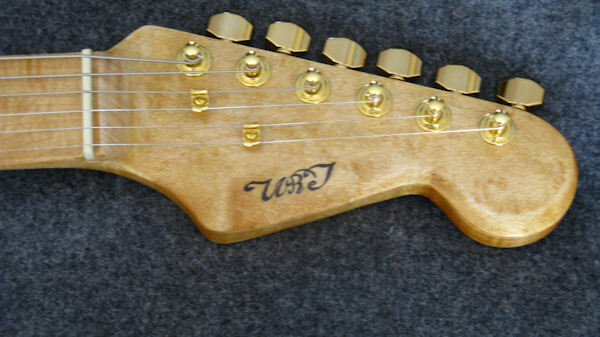 The middle pickup is reversed-wound for hum canceling in position #2 and position #4 . A mini toggle On/On switch installed next to the 5-way lever switch allows the player access to two additional sounds - the neck pickup and bridge pickup together or all 3 pickups (neck, middle & bridge) together. Pickup cavities and control cavity thoroughly shielded with 2 coats of conductive shielding paint for noise-free, high quality performance. Black pearloid pick guard and gold control knobs with abalone caps. 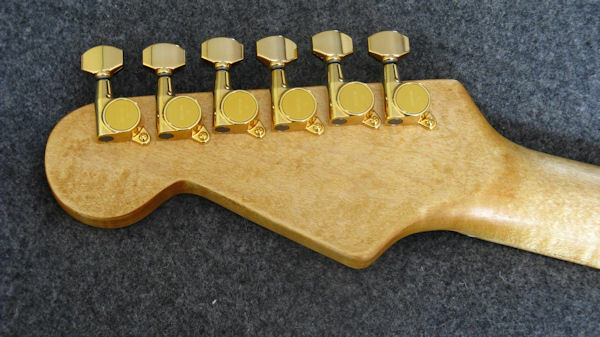 Gold-plated brass bridge with fully adjustable saddles. High quality, gold-plated Gotoh guitar tuning machine heads, with 16:1 gear ratio.